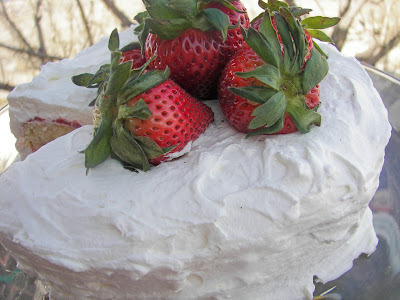 Red Couch Recipes: Strawberry Cake and a Great Kitchen Giveaway! First I have provided information on the Kitchen Giveaway (five great items to choose from) and then I have provided the recipe and directions for the Strawberry Cake! I am so pleased to be able to offer this great giveaway sponsored by CSN which has over 200 web-based stores. They have everything from Corner TV Stands to pots and pans. You will also find beds, toys, and exercise equipment. 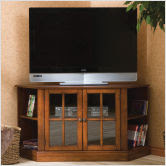 If there is something you are shopping for, please click on the link above to see an amazing collection of corner TV stands and racks and much, much more! 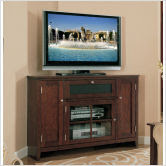 I was very impressed with their wide variety of great and convenient corner TV stands. 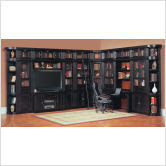 CSN provides free shipping on many items. Be sure to pay CSN stores a visit to show your appreciation for this amazing give away. 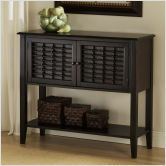 They also have sideboards, buffets, consoles, and cooking racks. 1. Must be in continental USA or Canada. For Canadian entrants, please be aware that there may be international fees that may not be covered by this giveaway. For Massachusetts entrants, please be aware that sales tax may not be covered by this giveaway. Void where prohibited by law. 2. To be eligible for this giveaway, please leave a comment telling me which prize you would choose if you should win. There will be one prize awarded from the FIVE choices below. If your e-mail is not listed in your blog or if you do not have a blog, please leave me your e-mail address in the comment section so that I can contact you should you be the lucky winner! If I can't access your e-mail, you can't win. 3. Double your chances of winning by telling me in the comment that you are a follower. 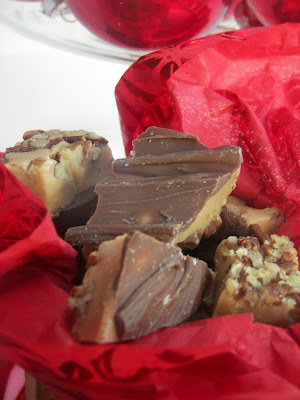 If you would like to become a new follower of Red Couch Recipes, please add your name to the Google Follower Gadget on the left side of my blog. You do not have to host a blog to be a follower. 4. One entry per household. 5. This giveaway will close on Friday, May 14, 2010 at 10 pm Mountain Standard Time. The winner will be randomly chosen. The Talent (a.k.a. my husband) will be in charge of the random drawing. The winner will be announced on my blog on Monday, May 17th 2010. 6. The prize will be awarded by CSN; I am not compensated for holding this giveaway. Should CSN be out of a particular item, you must make another choice. Of course, you can change your mind about which item you would like. 7. These items were chosen by me. They are similar things that I have in my kitchen or would like to have. Please click on the red links to see the details of the available prizes. There are other lovely colors too. This contest has been sponsored by CSN. Please feel free to check out all of their wonderful corner TV stands, baking racks, sideboards and such at their Racks and Stands Store. Now for a fun and easy springtime cake! There are no complicated directions for this cake! Make 2-layer cake of your choice. An angel food cake or white boxed-mix cake would be fine. Bake and cool cake layers on wire rack. Puree strawberries in blender. Put strawberry puree in small sauce pan and add sugar and cornstarch. Heat on medium until just barely boiling. Take off heat and cool. 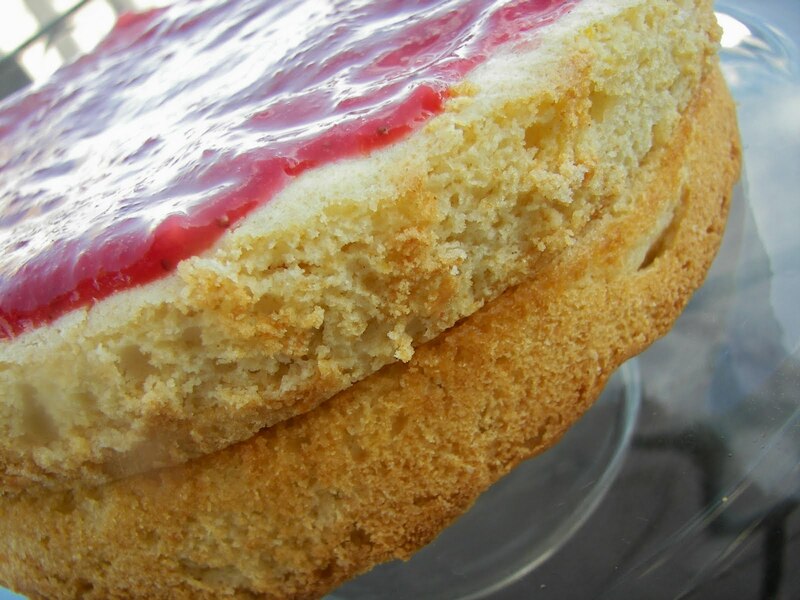 Place bottom layer of cake on cakestand and spread strawberry sauce on top. Place second layer on top of bottom layer and spread strawberry sauce on top. 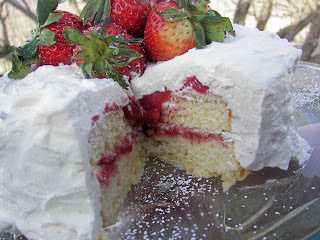 In the picture below, there is strawberry sauce between the cake layers, but it is not visible. Whip one pint of whipping cream and add vanilla and sugar to taste. Spread whipping cream on cake. You may have leftover whipping cream, depending on how thick you want the whipping cream frosting to be. Garnish top of cake with fresh strawberries. 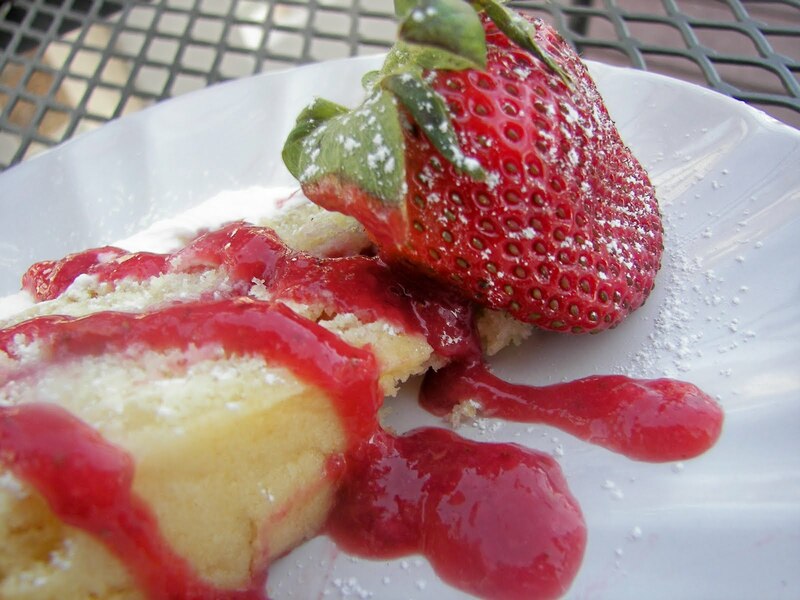 Slice cake and garnish with additional sauce and fresh strawberries. I am posting this with Blessed With Grace's Tempt My Tummy Tuesday. I am also posting this with Beauty and Bedlams's Tasty Tuesday. I am also posting this with All the Small Stuff's Tuesdays at the Table. Well, mykids vote for a new ice cream maker (ours is on it's last legs). And you know Ifollow :) The strawberry cake looks yummy! I would love those adorable glasses with the bees on them! They are so cute. I am a follower already! OK and now I want some strawberry cake!! We would love Chef's Choice International PizellePro Express Baker....I love a good pizelle!!! 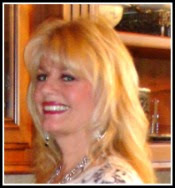 I am a new follower :)...though I have been blog stalking you for a while! Such great prizes to choose from! I love the glasses and the Le Creuset dishes but I think I would choose the kitchen scale, it might help with my new diet. The cake looks delicious. I am a follower and I'd Love the tumblers. They're so cute. YUM! I'll be right over and I'll bring the coffee. Who wouldn't LOVE to win an ice cream maker? If I win I promise to make only healthy frozen concoctions. OK, I lied about that. But I would love to win anyway! I LOVE TATI AND YOUR MUSIC SELECTION. I LISTEN WHEN I CLEAN MY HOUSE. ALSO, LOVE TATI AND YOUR RECIPES. I WOULD LIKE TO WIN THE ICE CREAM, YOGURT, SORBET MAKER. I like the baking dishes too! Actually I'm just drooling over the strawberry cake, which is not on my diet! I have not seen one like that and I will try it!! Thanks for stopping by! I loved the Le Creuset. I'm now a follower. The cake looks delish. I love Le Creuset! I am a follower now. I love the green baking dishes! And you can't go wrong with cake and strawberries; yum! Im a follower now! My ice cream maker just broke so I would go for that! 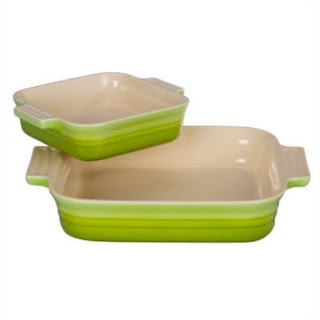 I would pick the Le Creuset 9 inch Square Baking Dish Plus Bonus 5 inch Baking Dish! I would love to have the glasses. I have some, but would love more of them. That cake looks too yummy. I would have to go for the ice cream maker! I became a beekeeper last summer so the bee tumblers would have to be my favorite! I would like the bee glasses. I'm partial to bees because the name Melissa means honeybee. The strawberry cake looks delicious; I'll have to try it soon. and wold like to win the bee glasses. We keep bees and i love finding adorable "bee" accessories! Oooh, I've heard so many good things about that ice cream maker! I'm a follower and want to thank you for hosting such a nice give-away! This store is a great place ~ The Le Creuset is calling my name....I'm a follower! kids know how lucky they are??? What a lovely giveaway! I would LOVE those Le Creuset baking dishes, especially in that gorgeous shade of green! I just bought a huge carton of strawberries, and I'm off to try that cake! Just became a new follower! I'd love to win those baking dishes! And I've been reading you for a while, but am now following. I'm always on the look-out for a great, new recipe to try. Stop by Life is Good if you have a chance! Joni, The cake looks outstanding! I am a new follower and I would love to win the baking dishes - or any of your prizes, really! Thanks for hosting this giveaway! I am a new follower but have been stalking your blog for a while. I had a couch just like the one in your header. I would love the bee glasses to add to my tablescapes. Hi! I'm already a follower and I thought I entered this. Weirdness. I would totally love the Strawberry cake. I would totally love the baking dishes! They are gorgeous. What a wonderful giveaway! I would love to have the baking dishes....I am a follower and I want to say thank you for offering this! What an amazing giveaway! If I were chosen, I would love the tumblers to enjoy lemonade and "summer beer" during the warm weather. The icecream maker for sure! And I am now a follower. 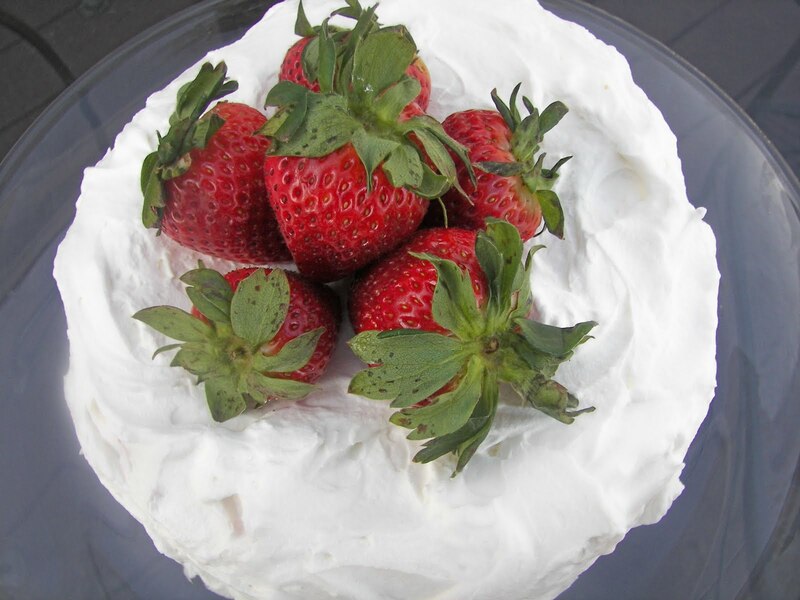 Your strawberry cake looks light and fresh and springtime! Well, I've found you again - it takes a long time when one has to trawl through the comments on someone's page to find a blog one had enjoyed. So, now I'm a follower, and I won't miss a single recipe - and if i were to win, I think I'd like that Cuisinart Frozen dessert maker. What a wonderful giveaway! Thanks for the opportunity to enter. I could (and have) spent sooooo much time on CDNs website - there are so many wonderful things! 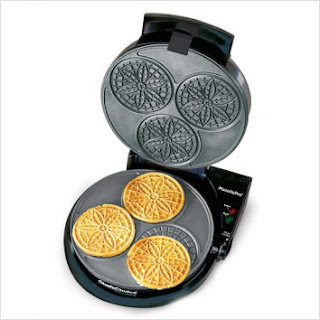 I think I might have to choose the pizzelle maker, or the ice cream maker... can't decided. I would love that ice cream maker. It gets so hot in TX, and it would be nice to be able to make some frozen treats! Would love the le creuset casserole dishes! P.S. I tried the yummy pasta salad for dinner the other day and the girls LOVED it! (think Garth did too) Thanks for sharing. Oh my, oh my, this is a wonderful site! I will be following from now on as I am new to the world of blogging and following. I love the LaRochere Tumbler in Napoleonic Bee Motif and would love, love, to have those little cuties living in my house! My sister has the Cuisinart ice cream maker and loves it. If I'm the lucky winner, I'd love to have one, too. 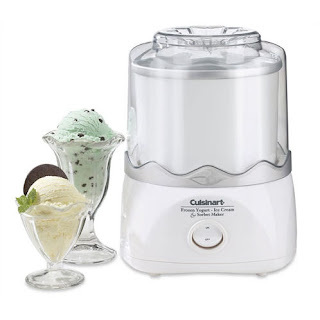 Without a doubt I would pick the Cuisinart Automatic Frozen Yogurt/Ice Cream/Sorbet Maker! My kids and I LOVE ice cream and to make it ourselves - how much better could it get! I would choose the pizelle maker. Your strawberry cake looks devine! oh wow! We are in need of an ice cream maker! It would be so fun to have another ice cream maker. Ours died last year right in the middle of the most delicious coconut ice cream. So delicious that we ate the runny ice cream anyway. I would love the baking dishes! Thanks! 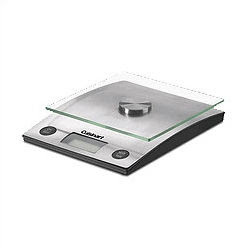 I have been making a lot of European recipes lately that involve weighing the ingredients with my very, very old scale. I'd love the digital scale! I love the Le Creuset baking dishes!! I would LOVE the frozen ice cream maker!! sooo great!! I would love to have the Cuisinart Automatic Frozen Yogurt/Ice Cream/Sorbet Maker! I'm also a blog follower! Joni, What a wonderful recipe! I just love strawberries and cake makes them taste even better, don't you think? I came over from your "pit-sell" post. I would love to get a Pit-sell maker, yummy. Please count this follower in! The cake looks scrumptious! If I were to win, I would probably choose the yogurt/ice cream maker. If I win, and I hope I do, I would choose the PizellePro. I think it looks like something the grands would enjoy when they visit. 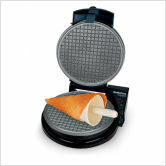 I want the cute little waffle irons!!! This is awesome!!! And I am a new follower too! I would love to have the Le Creuset Dishes in red please! I am a follower. That strawberry cake looks scrumptious! You are amazing! I would love the Le Creuset baking dishes. So fun. Luckily I recently acquired an ice cream maker - so I'm going to choose the Le Creuset baking dishes. I love everything they make, but my poor graduate student pocketbook doesn't! Your strawberry cake looks divine. This time of the year there is nothing that can top a strawberry, unless it's homemade ice cream! I can't buy much ice cream that doesn't have sugar. The ice cream maker would be perfect for me, and I promise I'll sing your praises every time I post a new recipe using it! Joni, I'm also a fan of your red couch and will follow you anywhere! I have been a follower of your blog ever since you posted Esther Bolick's Orange Marmalade Cake recipe and I stumbled on your blog from google! :) Yummm great blog, and such a cool idea! 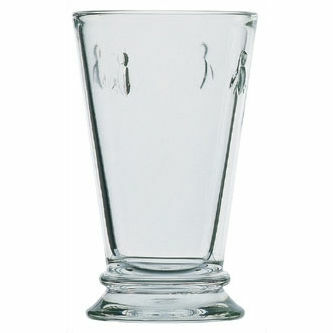 I would love to win the French Home Gourmet LaRochere 12 ounce Tumbler (set of 6) in Napoleonic Bee Motif. I have long admired these glasses but dont want to pay so much for them!!! :) happy blogging! Just found you today. The ice cream maker would be fun for summer. I am a new follower of your wonderful blog! That ice cream maker would be so fun, but I do need a new pizzelle iron and being able to make 3 at a time would be wonderful! Please choose me!